Centaur Equine Specialty Hospital Now Open in Shelbyville, Ind. Construction of the Centaur Equine Specialty Hospital was completed in February. 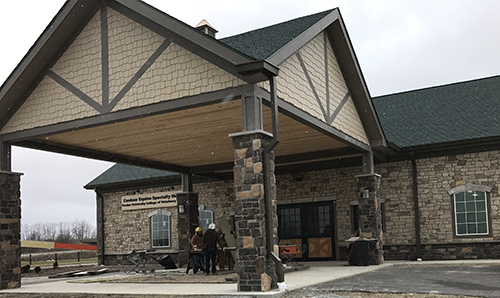 After a year of construction, the new Centaur Equine Specialty Hospital in Shelbyville, Ind., has opened for business and is accepting patients. Designed as a state-of-the-art equine specialty hospital in the vicinity of Indiana’s two race tracks, the facility opened at the end of February to promote the health and performance of equine athletes. The hospital is located at 350 W. Bassett Road in Shelbyville. Appointments can be scheduled by calling 317-398-1980, or e-mailing CESH@purdue.edu. The 17,000 square-foot structure cost $8.8 million. The local governments in Shelbyville and Shelby County committed $2.3 million for the project and the College raised the balance of the funds, including a $3.1 million pledge from Centaur Gaming, which owns Indiana Grand Racing and Casino, to name the facility. Features of the new hospital will include an Equine 4DDI diagnostic imaging system, expected to be installed this month, which contains two robotic arms, allowing a horse to walk in-between for more efficient processing. The robotic features make it possible for the horse to stand as the unit performs all types of diagnostic techniques, including x-rays, fluoroscopy, CT and tomosynthesis. With the hospital open and operating, plans now are being made for an official Dedication Ceremony in April, in conjunction with the start of the racing season. For more information about the Centaur Equine Specialty Hospital, visit www.vet.purdue.edu/CESH.